Gutted at plans for a shared Gallery and Library in Waikanae are on hold. The majority of the Waikanae Community Board is gutted at the decision made last Thursday to defer funding for the integrated Public Gallery and Library in Waikanae. This decision was made by the Council’s Operations and Finance Committee, chaired by Waikanae Ward Councillor Michael Scott [the other members are the remainder of Council as a whole and one Māori representative], as part of the plans approved to the capital expenditure programme for 2017/18 financial year. Even more alarming, this project has been put on hold for possibly five to ten years. Although the Council says it is still committed to funding its share of the Mahara Gallery upgrade on the current Gallery site, but this is dependent on the Gallery raising the required funds by the June 2018 deadline. In the meantime, the Council intends to look how it can extend the life of the Library. Although this project has been budgeted for since 2006, there have been u-turns in its design, and the Council was left in a situation where it was unable to secure a suitable site. Furthermore, the $9 million price tag was not inflation-proofed and is now estimated to be in the order of $12-15 million, excluding the price of any land purchase. While it is laudable that measures are being taken to reel in spending and debt, Waikanae Community Board members have been blindsided by this turn of events and is very disappointed that this project has been targeted. They believe Waikanae is severely lagging behind in KCDC infrastructure investment although Waikanae is the fastest growing part of the Kapiti Coast, and thus where the growth in rates is. Waikanae businesses have been in a state of flux not knowing what is happening to their Town Centre but now they will have to wait much longer. This also puts other work planned for around the Waikanae Town Centre in uncharted territory. Waikanae Board members are not going to sit back and wait five or ten years. They believe that throwing money at a Library building that could be gutted or pulled down is a waste so they are starting discussions on the best way forward. We’ve said several times on here that Paraparaumu Town Centre has had its fair share, Waikanae hasn’t. The existing Mahara gallery building is too small to do justice to what is available to display and is a boring building — see the earlier posts. And that’s the way it’s going to be for a while yet. 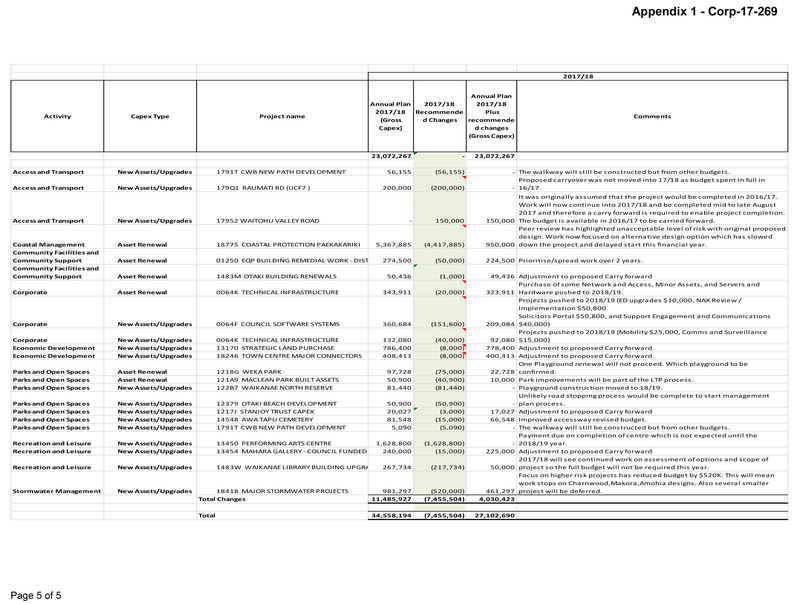 The schedule above is what the council bureaucrats wanted chopped from the capital expenditure plan this year — $7.5 million from $34.6 million (click for full view) — and it sounds like it was rubber stamped by elected members. down the project and delayed start this financial year. Well, we have warned about the need to avoid yet another expensive white elephant, so this bit is good, anyway. The curious word in the phrase above “The majority of the Waikanae Community Board is gutted” is of course “majority” — so who isn’t? Michael Scott? We’ll report when we find out. I am disappointed to see this post – it is sadly inaccurate and seems to have caused some mischief where there needs to be none. There was a budget in the 2017/2018 financial year for the Mahara Gallery Upgrade of $240k. We moved $15k into the next financial year leaving the balance still available for this project . This protects that part of the budget we were unlikely to spend and makes it available in the future. The balance of $225k remains in place. The Mahara upgrade including the cultural thread is still in place as is the Highway hand back project – both of which the WCB is regularly updated on. There is $600k in the current years budget for this ongoing work. Michael Scott, Waikanae Ward Councillor, Chair – OFC.